I visited Antigua and Barbuda many, many years ago. However, it was the first time for Nikks. Antigua is known for having more beaches than days in a year. Now think about that, wouldn't you say it sounds like a fantastic island to visit. I mean, think about it. You can go to a different beach each day of the year. Just amazing stuff man. Anyway! We touched down in Antigua on December 21st and it was a beautiful day, the sun was shining and the skies were blue with a few white clouds fluttering around. Nikks was anxious to see what Antigua had to offer and I wanted to see what had changed. To be honest I was here so long ago I can't really remember much about the place. The other islands we visted before arriving in Antigua and Barbuda were Guadeloupe, Santo Domingo, Calalina Island and St Maarten. After Antigua we headed to Fort De France Martinique. 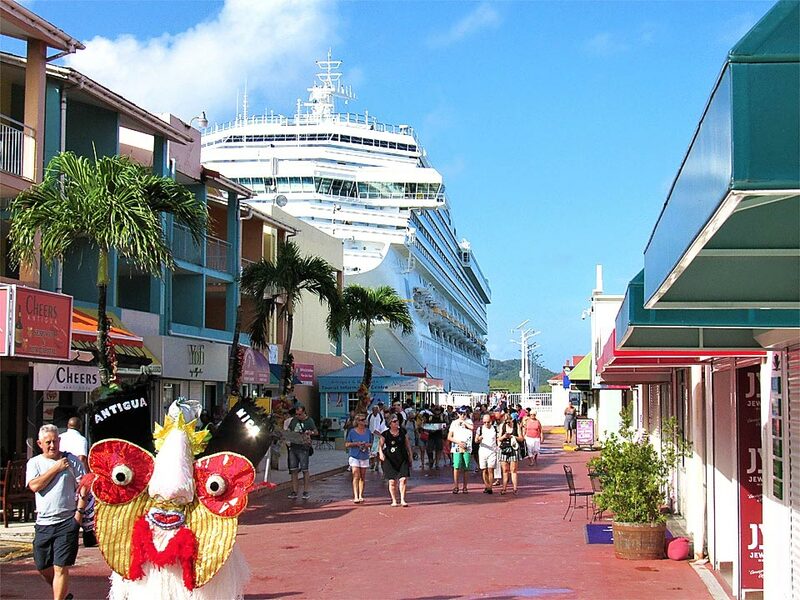 The cruise ship in the background in St. John's, Antigua and Barbuda. While planning our trip we looked at things we could do in Antigua. We found that the tours and other activities were a bit more costly than on the other Caribbean islands. 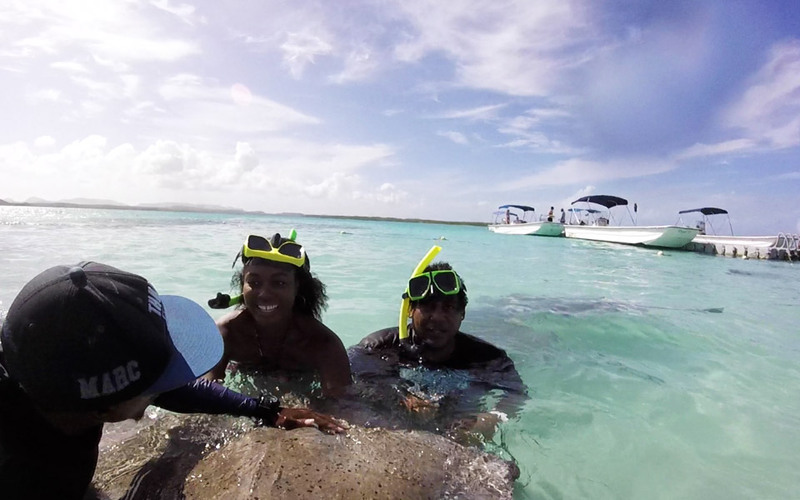 However, one of the activities that caught our attention was visiting Stingray City. The cost was not that bad at all. It was about 50$ US per person. This however, was only going to take up part of our day and was scheduled for the afternoon, we had to find another activity to keep us occupied during the morning period. After deliberations and speaking with local tour and taxi operators, we decided to spend the morning at Long Bay Beach, then head out to Stingray City in the afternoon. They were basically located in the same area. was it bad treatment by our caribbean brothers? Before I tell you about the amazing experience we had in Antigua, I would just like to let you know about something we noticed. After we disembarked the ship, and headed to the tourist information section to get info about available tours and rates from the taxi dispatchers, we realized that none of them was paying us any attention. We stood close to them trying to get their attention, but they just kept ignoring us. They were all rushing around to attend to the European visitors from the same cruise ship. We did not believe we were experiencing this kind of treatment from our own Caribbean people. We also experienced the same thing in St Maarten. Anyway, that being said. 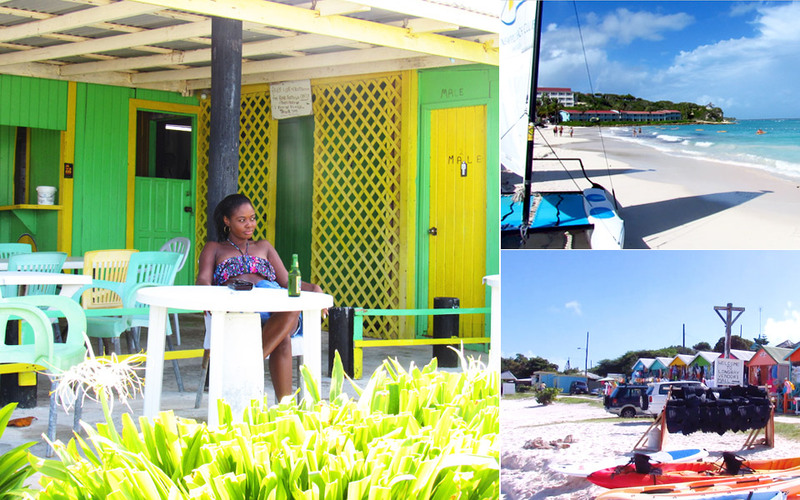 Let us tell you about our time in Antigua and Barbuda. 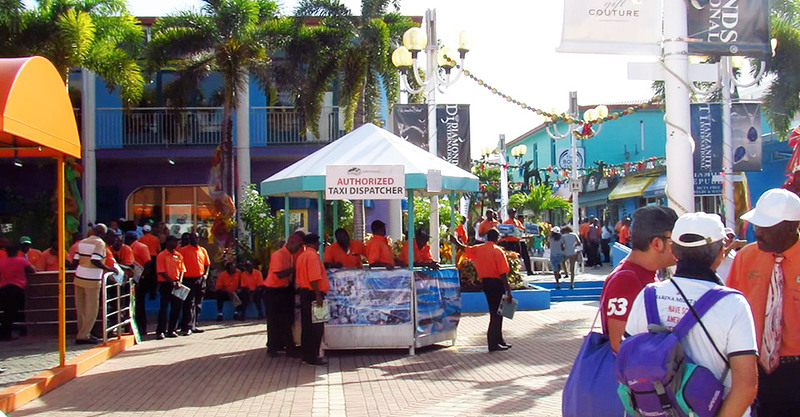 Taxi dispatchers and tourist at the cruise ship complex in St John's, Antigua and Barbuda. So after finally getting a taxi organized we headed to Long Bay Beach. They have a good system with the taxis/mini buses. We shared the taxi with a group of six other people and split the cost and it worked out pretty good for us. We paid US$ eight bucks each to Long Bay Beach. It would later cost us US$ 15 for both of us to get to Stingray City and a further US$ 28 from Stingray City back to the cruise port. 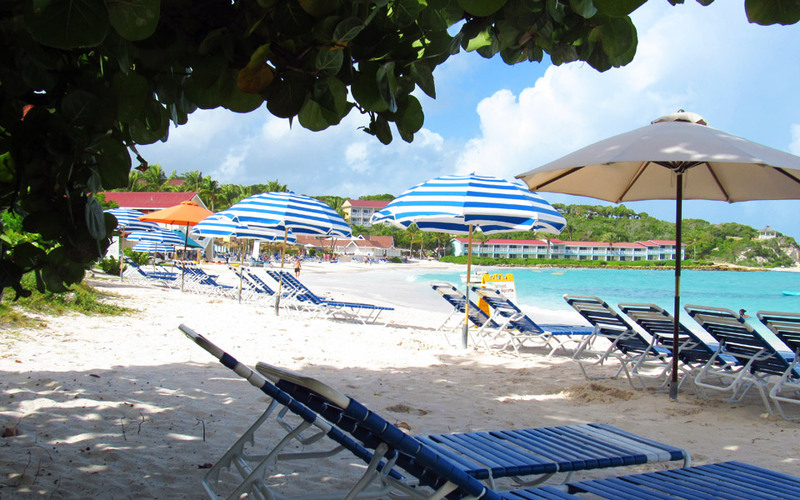 As I mentioned before Antigua has a lot of beaches and when we arrived a Long Bay Beach we were satisfied. It's a beautiful little beach located on the East Coast of Antigua about a five-minute drive if you are in the village of Willikies. The white sand and the crystal clear turquoise blue water invites you to come in and that is exactly what we did. We jumped, swam and splashed all over that beach. We rented a beach chair and umbrella, which are available from one of the small shop owners on the beach, kicked back and relaxed. All that was missing was a beer, rum and coke or a glass of wine. Unfortunately the bar and restaurant located on the beach was not opened as yet. This was surprising to us. The beach had a reasonably amount of visitors, why won't you be opened. It was around 10 a.m. is that too early? Well I guess in Antigua it is. I guess I should have expect this because the island seems to be really laid-back, as most Caribbean countries are. Things seem to move on its on groovy pace. After enjoying Long Bay Beach for several hours, eventually getting a Wadadli, that is the local beer and having a couple of drinks of Cavalier rum and coke, Cavalier is a local rum as well, we realized that it was time to head out to Stingray City, Antigua. View of Long Bay Beach from the shade. Below: Nikks enjoying a local beer at the beach bar. Top right: A view of Long Bay Beach. Bottom right: Small shops on the beach. About twenty minutes drive from Long Bay Beach, we arrived at Stingray City with much anticipation. Nikks wanted to do this so much that she did not care what the cost was. Even when we were planning our trip she kept insisting we do it. When we left the taxi and headed to check out our package her eyes lit up like a red bulb on a Christmas tree. After we registered and signed a waiver, we took a stroll around the place. On the compound there are a couple cages with parrots and other animals. There were a couple really beautiful parrots saying "hello, "honestly". They are really amazing and they seem to be posing for us to take selfies. We were summoned to a briefing, which informed us of where we were going and how to safely interact with the stingrays. We were told that the rays are not dangerous and the only way we could get poked with the tail is if we accidentally step on them. We were also told how to feed them. Also, of note is that the stingrays are not penned or caged. They are out in the open sea in a shallow spot, which also contains a reef. So, we boarded the boat in groups and headed out to meet the rays. I hate boat rides and I could tell Nikks was watching me squirm. It wasn't that bad though. We pulled up at the spot and were handed snorkel equipment and given some more instructions. We observed that there were a lot of stingrays in the water. Some were pretty large and some were small. I could see the excitement building on the face of Nikks, she was smiling heartily and I could tell that she was enjoying the stingray encounter. It was one of the most amazing experiences we have had since we started traveling. Nikks smiling as she encounters a stingray, but is she secretly scared? 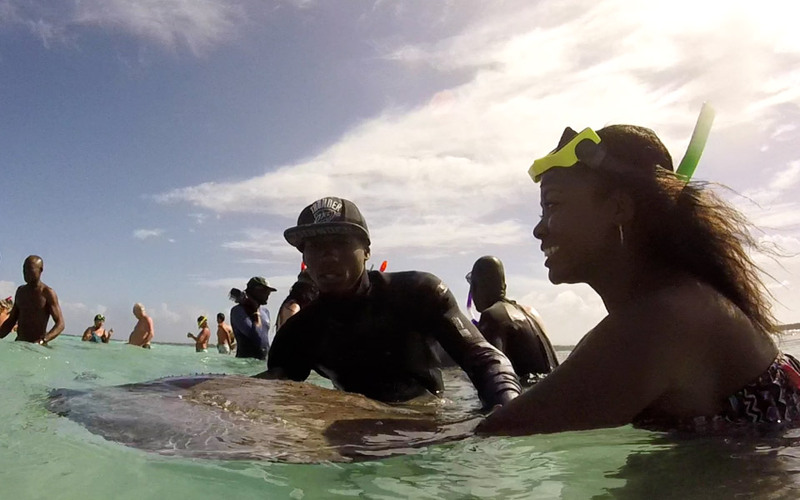 Nikks and I interact with a stingray assisted by one of the guys from Stringray City Antigua. So after spending an hour or more with these lovely marine creatures we came back to shore energized and with a greater appreciation for the marine life of the sea. Of course no tour or trip in the Caribbean is completed without a complimentary rum punch. There was also fruit punch for the kids and for those who don't drink alcohol. Bear this in mind. There is a difference between Stringrays and Manta Rays. What is the difference you ask? Well manta rays are larger than the stingrays, manta rays has a wide, gaping mouth while the stingray's mouth is located on its underside. More on the difference between stingrays and manta rays here.